From the very first page FATAL MISTAKE had me in it's grip! From the moment Tara finds out that her life-long friend and neighbor is the Lone Wolf Bomber she is on the run from him. After all, she found all of his bomb-making equipment and he shot her AND threatened her while she was in the hospital. Tara had no choice but to run. Special Agent Cal Riggins was the person who answered Tara's desperate 911 call and he has promised to protect her from Oren. But how can he protect her when Oren was able to get to her in the hospital? If Cal and his team can find Tara so easily then of course Oren will be able to. Once Tara realizes that Oren is targeting people she has come in contact with she agrees to help the FBI track him down before it is too late for another person. Both Cal and Tara are attracted to each other but both are struggling with issues in their life and neither is in a right place with God to pursue a relationship. But the more danger that each of them is in the more they realize there is no fighting what the heart wants. You know you are in for a great read when from the very first page you can't seem to put the book down. 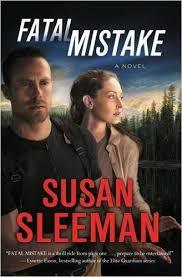 FATAL MISTAKE was just such a book! The author takes the reader on a roller coast ride that keeps the heart pounding and the fingers swiping or turning pages(whichever way you prefer to read your books nowadays). Not only was there suspense, but there was also romance. Two of my favorite things! While the suspense kept me on the edge of my seat the romance melted my heart. I loved Cal and Tara's characters. I also loved the spiritual aspect of the book. There isn't a lot of preaching in the story, but it shows both characters having natural struggles with their faith in God, and how those struggles formed their character and their relationship. This is the first book in the White Knights Series and I have to say that I am hooked and cannot wait for book two! Which by the way, there is a sneak peak of at the end of book one!